The public is interested in the world around them, and today's climate and ecological issues are making news headlines daily. Not surprisingly, new ways for people to contribute to this knowledge are popping up everywhere. One field where this is especially true is ecology. Several Apps have appeared for iPhone and smartphones that make it possible for any person to catalog ecological data about the world around them. The first of these is a really cool application called 'Lampyr'. It was developed by an assistant professor at the University of Tennessee. It is completely free, and runs as a website. Today's social networking capabilities and smartphones have made citizen science increasingly possible.Once you visit lampyr.org on your smartphone or computer, the app uses your location information (be sure to enable location sharing!) to generate information on the specific biological species around where you are standing right at that moment. Click on 'Find Closest Species' to instantly learn about the world around you. Click on a species of interest for more detailed information. In addition (and most importantly), you can easily catalog species you see for others to learn about. Now, what does this all have to do with this blog? Well, Lampyr is an excellent tool to learn about species around the ocean and intertidal zones near you. But on top of this, other organizations have begun creating similar science applications that can expedite the gathering of data. One of the newest of these is called Coastbuster by Ocean Networks Canada. It is particularly cool because, as I have stated before, volunteers and community members are going to be the front lines for tsunami debris, because there is currently little state or federal funding to deal with the inundation of debris that will wash onto shores in winter. Coastbuster is currently only available for Android, and the iPhone version is still in development (I know, I know). 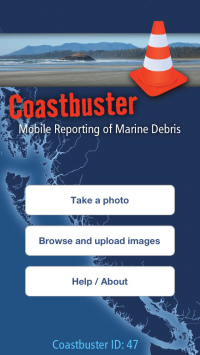 Once you download Coastbuster, you will be able to open the app and are presented with a list of options. You can either take a photo, or upload a photo that you have already taken. By simply taking a photo of debris, adding a bit of additional information, you can contribute to a comprehensive catalog of marine debris, and make it possible for Ocean Network to identify hot spots of debris that could be in need of study or clean up. It will also be an extremely valuable tool for scientists who want to study how currents and winds influence the deposition of debris across our shores. Reports are anonymous, but are very valuable as we try to gather data regarding tsunami debris. This is a great way to be involved with your community while helping out researchers and volunteer organizations! Keep an eye on my blog for news as to the iPhone application, and others that might be developed in the meantime. So where is that debris now? NOAA has updated their models, and it is slowly making its way inshore. Models for early December show that the bulk of the debris is laying about 1,000 miles from the west coast of North America, but high windage and smaller items may begin showing up through January, when a majority of the flotsam is predicted to occur. Model Projection: NOAA. Visit here for a larger image. For those of you who still haven't seen the animated version of NOAA's debris model, visit this page for a brief background and the animation itself.